On May 26, 2007, the Ku Klux Klan planned a march in Knoxville, Tennessee. Opponents tried to figure out a way to oppose their racist, hateful messages without stooping to hatred themselves. They decided to start a troop of clowns called the Coup Clutz Clowns who would intentionally misunderstand the Klan’s message and make gentle fun of it. 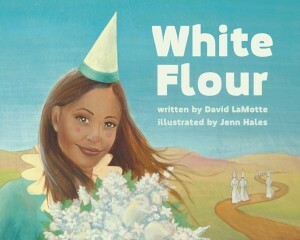 White Flour, by David LaMotte, tells that story in a picture book for children. I was so excited when I first heard about this book. I get a tad upset when I see some of the banal books out there that people try to push on children. I swear if I see one more adaptation of Noah’s Ark I’m gonna snap. I mean, what ding-dong thought that a story of divine genocide would be good for kids just because of the cute handful of animals that made it through the watery apocalypse? But finally we have a book for children that is not patronizing. A book that does not feel the need to dumb-down some of the most difficult dilemmas of life. A book that tells our kids a story that they really need to hear. The story of standing against violence and oppression without resorting to violence and oppression. The story of using laughter and joy to combat hatred and bigotry. The story of overcoming evil with good. The story that shows that you don’t need fire in order to fight fire. White Flour is an important book and I recommend it highly. There are aspects of the story that parents will need to explain to their children, like what the KKK is all about and why it’s important to stand against messages of hate like theirs. It’s important to me that my children see examples of people standing up against evil in pure, non-violent, non-hateful ways. White Flour stands as a monument to a small group of people who found a Jesus-like way to push back the darkness of racism and hate. I treasure this book and hope you all grab yourself a copy. Seems that when you’re fighting hatred, hatred’s not the thing to use! So here’s to those who march in in their big red floppy shoes!